The leading enterprise of automobile interior and exterior decoration - Rentong (stock code 870713), established in 2004, is located in Xingtan Town, Shunde District, Guangdong Province, with an investment of 120 million yuan, with a manufacturing base of 50,000 square meters and interior and exterior decoration of 1000 square meters. An integrated exhibition hall, more than 100 professional service teams, more than 800 employees, annual production capacity of more than 3 million sets, and over 100 patents. It has national high-tech enterprises, the second batch of pilot demonstration enterprises of “Made in China 2025” and the provincial-level enterprise technology center of Guangdong Province. In September 2017, Shunde, Guangdong Province, was established as the China Automobile Refit Academy, the first refit school in the country, and focused on cultivating professionally-adapted car modification talents for the post-market. Looking forward to the future, the company is entering the fast lane of development, and will continue to adhere to the concept of “innovative quality products and serve customers all over the world”. We look forward to achieving concept consensus, market governance and benefit sharing with all partners; A world-class automotive supplier with value, competitiveness and influence! The first batch of model colleges in the country--Shunde District Secondary Professional School was established in 1958. It has more than 60 years of teaching history and won the "National Key Secondary Vocational Schools" and "National Automobile Application and Maintenance Skills Shortage Talent Training Base" And the "National Vocational College Transportation Model Demonstration Point" and other honorary titles. The school's automobile major was established in 1991. It has a team of "double-skilled" teachers with high quality and strong skills. It has cultivated a large number of high-level and high-income talents for the society for many years. The automobile professional independent training building has a total area of 10,000 square meters and facilities and facilities of about 80 million yuan. It is a first-class professional training base for strength and supporting facilities in Guangdong Province and even the whole country. Guangzhou Light Industry Technician College is a state-level key public full-time technical college, which is under the administration of Guangzhou Human Resources and Social Security Bureau. 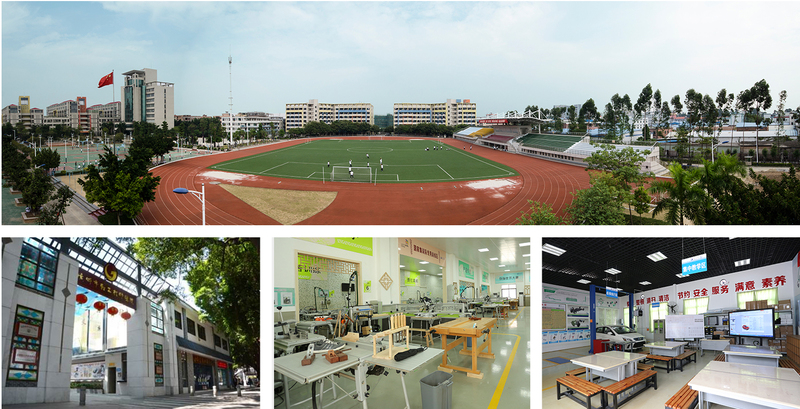 Since its establishment in 1958, the college has become a high-end educational entity integrating vocational and technical education, high-skilled personnel training, vocational qualifications, employment guidance and services, and production, education and research. In the training and management, the implementation of the "integrated approach" teaching model and 6S management to help students adults, talent. Training + actual combat, rational and integrated teaching, three-point theory, seven-point practice, group teaching.